Just for me because I don't ever seem to keep anything I make. 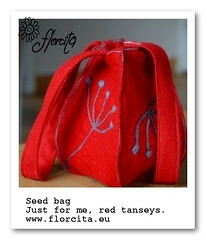 A seed bag just like those in my DaWanda shop but with a different surface design: all red with tanseys on them. It is lined with gorgeous hand made original Harris Tweed.Simple, but effective.